Our advance multimedia player is an inexpensive and easy to implement solution to add advanced digital signage for any organization of any size. 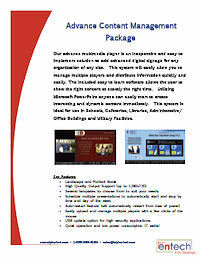 This system will easily allow you to manage multiple players and distribute information quickly and easily. The included easy to learn software allows the user to show the right content at exactly the right time. Utilizing Microsoft PowerPoint anyone can easily start to create interesting and dynamic content immediately. This system is ideal for use in Schools, Cafeterias, Libraries, Administrative/Office Buildings and Military Facilities. Several templates to choose from to suit your needs. Schedule multiple presentations to automatically start and stop by time and day of the week. Easily upload and manage multiple players with a few clicks of the mouse. USB update option for high security applications. Supports MP3, MPEG1/2/4,WMV, DIVX, JPG, PNG, TXT and PowerPoint Files.